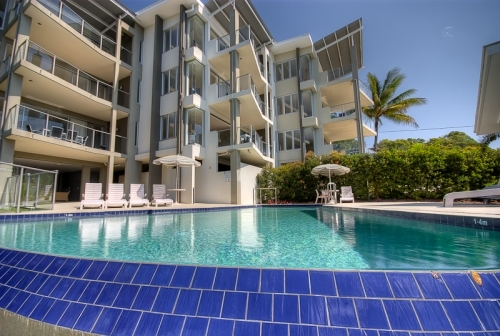 Rainbow Ocean Palms is a small boutique resort positioned on the highest point in Rainbow Beach, offering panoramic ocean views to Fraser Island. The resort is nestled into the coastal forest and overlooks the small coastal village of Rainbow Beach and its long, sweeping white beaches. Rainbow Beach is located 2.5 hours drive north of Brisbane airport and 1.5 hours from the Sunshine Coast and Fraser Coast airports. 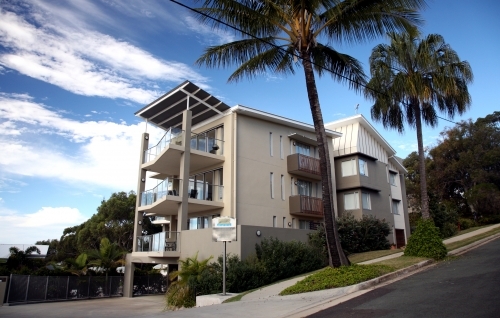 The modern luxury apartments open out to large balconies with cool sea breezes and sweeping views of the bushland and the seascape beyond. Each apartment is fully self-contained with large, open plan living areas and spacious spa baths, providing the perfect combination for a relaxing holiday experience. 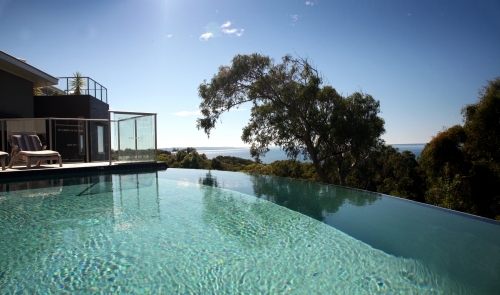 The wet edge pool offers wonderfully relaxing views through the forest and endless ocean views to Fraser Island. Sunset drinks and casual dining with spectacular ocean views are available at the award winning Waterview Bistro which is located within the resort. Activities on offer range from total relaxation in a tranquil, peaceful setting to adventure-filled tours into the Cooloola rainforest and to the coloured sands, or to World Heritage listed Fraser Island which is just a ten minute barge ride across the ocean from Rainbow Beach. 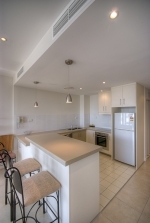 The newly opened Cooloola Great Walk begins directly adjacent to the resort and provides short and longer walk options. Walking tracks follow the coloured sand cliffs along the coastline and continue on through unspoilt tall forest and wildflower heathlands. Explore the longer walks to arrive at Double Island Point lighthouse and its rocky coves and headlands. The resort offers walking packages with everything required for a day of physical challenges and rewards on spectacularly scenic coastal tracks. Rainbow Beach is a small friendly community where the local people enjoy sharing their knowledge and experiences with visitors. Whether swimming at the patrolled beach, bird watching in the coastal sand dunes or taking a short walk to Carlo sand blow, which is a famous natural attraction, visitors are made to feel welcome while enjoying the town’s incredible natural beauty. Rainbow Ocean Palms Resort is superbly located within a region rich in diverse natural attractions and opportunities for exploration and nature appreciation. The surrounding Great Sandy Biosphere was declared in recognition of the successful co-existence of nature-based tourism and the natural environment. We invite you to enjoy this unique experience where luxury accommodation merges sustainably with the internationally recognised Great Sandy National Park.